Teenage Mutant Ninja Turtles 3: Mutant Nightmare puts more of a focus on teamwork, character development and control than any other console Turtles game to date. 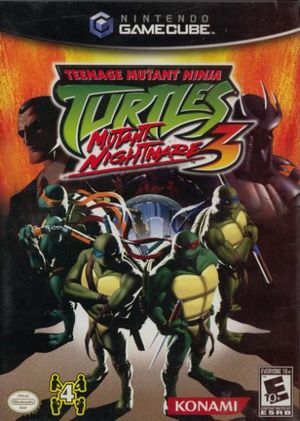 Gamers can play as their favorite Turtle alone or with up to three friends, earning experience points along the way as they slash and bash Foot Ninjas and powerful, well-known bosses from the TMNT universe. These experience points allow players to improve and evolve their Turtles' traits and abilities for more varied, powerful attacks and moves. The Ninja Scroll System is another new feature on TMMT3. Being able to select which ninja scrolls to use allows the Turtles to use various special abilities strategically. Cooperative play lies at the heart of TMNT3 and gamers who team up with friends for multiplayer action are rewarded with exclusive features such as Cooperative Attack for even more shell shocking damage to enemies. The effect of this attack changes depending on the number of players working together (between 2-4 players). For even greater control, TMNT3 features a new combat system called the Target Attack system that lets gamers play more instinctively and strategically. With the Target Attack system, players will be able to lock onto specific enemies and block, dodge or counter attack accordingly for smoother and more maneuverable combat. Story Mode can be played with 1-4 players. Even when you have less than 4 players to play, the other Turtles will be at your side, controlled through AI. All the Turtles can participate in Cooperative Attack to beat enemies and players can give commands to the AI. Using Internal Resolutions above 1x can cause a line of garbled pixels on the edges of the screen. This can be corrected by enabling the Vertex Rounding hack. Refer issue 10186, applied by default in 5.0-7714. The graph below charts the compatibility with Teenage Mutant Ninja Turtles 3: Mutant Nightmare since Dolphin's 2.0 release, listing revisions only where a compatibility change occurred. This page was last edited on 2 January 2019, at 07:36.